Its no secret that I love a home baked good, but sometimes I just don’t have the time to bake banana bread or cookies from scratch, so yes baking mixes are sometimes the most handy thing. Yes some baking mixes are not the healthiest, and I have tried my fair share of healthy mixes. This was before I found Soullful Tribe and to be honest I haven’t looked back nor tried any other brand of health mixes since. Often baking mixes are full of refined flour, sugar, fillers, and other things we no longer want to be eating, however Soulfull Tribe mixes are plant based, gluten free, dairy free, refined sugar free as well as organic. They use some of the best ingredients in all their mixes, are delicious and are the perfect healthy snacks for you to whip up when you’re short on time, on the go or maybe just not the best at whipping up something from scratch. Usually, when making healthy snacks from scratch, you have to go to the shops and buy a whole heap of ingredients that aren’t always easily accessible that can also be pretty expensive; especially when different snacks involve different ingredients. If you have tried other brands of mixes, you will know that most of the time they involve just the dry ingredients and then you have to add the multiple wet ingredients that are needed. 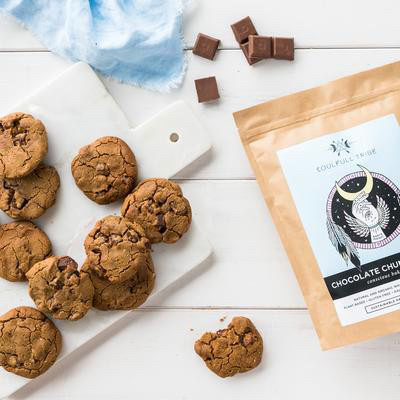 Soulfull Tribe create the best baking mixes with both dry and wet ingredients they include a bag of all the wet ingredients you need, all as you have to do is add the plant based milk of your choice. Now for the thing I love most; All their packaging is biodegradable and 100% recyclable, not to mention that they’re also a proud member of 1% for the planet. This is so important to me and these small changes along with all their ingredients being plant based, are all ways to help save the future of our planet. The banana bread - ‘The most incredible satisfying, super-moist banana bread’ is how it is described and they don’t lie, its amazing! The chocolate brownie (I sometimes even add raspberries or hazelnuts into the mix). So fudgy and so delicious! Finally The chocolate chunk cookies; chewy and crunchy goodness. They even add in some extra cubes of chocolate for those of you who are like me and LOVE chocolate! Have you guys got any healthy mixes that you love? Comment them below so I can be sure to give them a try! As much as I do love a healthy mix for those days when I am short on time or have some friends coming over last minute, I do still love baking some of my treats from scratch. I have a few favourite recipes from other food blogs that you can check out here.